PLA is an excellent 3D printing material with a low glass transition temperature and high tensile strength. This means you can print stiff parts with minimal warp in ambient conditions. Additionally, PLA doesn't emit strong odor when printing - making it great for office or school use. ABS is an engineering material with superior impact resistance as well as a longer plastic deformation region - meaning it will bend before it breaks. ABS's high glass transition temperature makes it difficult to print without significant warping, and to do so requires a heated build plate to compensate, which can add another point of failure to the printing process. 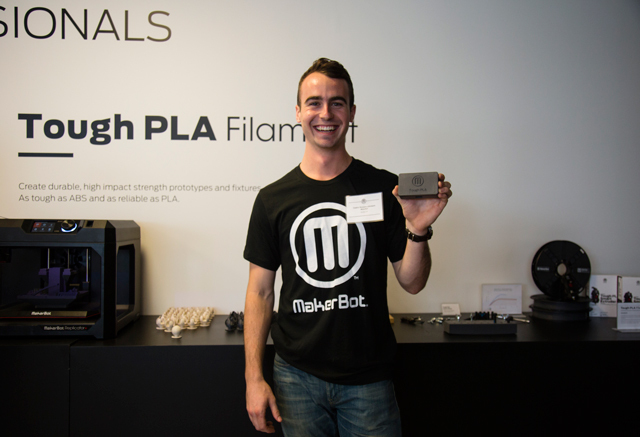 What was the impetus for MakerBot developing Tough PLA, and what sort of formulation process did you go through? Who is Tough PLA's target user, and for what cases do you expect to see it used most? What is the approximate cost difference between Tough and standard PLA? We sell the Slate Gray Tough PLA Bundle for $379, which includes a dedicated Tough PLA Smart Extruder+ and three 2lb spools of Tough PLA. Because the material requires an extruder with a unique drive system and built in print settings, an approximate value of $199 when compared to the standard Smart Extruder+, the filament comes out to about $60 per 2lb spool. Our standard PLA runs $48 per 2lb spool and $65 for more specialty translucent or neon colors. When would you use Tough PLA instead of regular PLA? Are there cases in which you would use both? Each material has their strength. PLA is great for stiff, high tension applications where part failure is not catastrophic. It can also be post-processed easily to produce high fidelity appearance models. Tough PLA is strongly suited for any high-wear or impact applications. Tough PLA's bend before break and natural lubricity make it a functional engineering material. How do Tough PLA's material properties compare to ABS? Can you give us a bit of a roundup of some of the other products that are enhancing the evolution of 3D printing, especially in the commercial sector? Stratasys has announced the development of two new technologies that are challenging paradigms in the commercial sector of 3D printing. The first is Infinite Build: an FDM system on a horizontal plane, rather than the typical vertical plane, that enables the production of especially large products at a potentially unlimited length -- an invaluable advantage for aircraft prototyping and manufacturing. The second is Robotic Composite: a robotic arm capable of 3D printing on 8 axis instead of the typical 3, allowing for incredibly precise geometries and moving away from the limitations of depositing material in planar layers. What are the most common drawbacks to 3D printing that need to be overcome in the next few years to get the processes into the manufacturing mainstream? The most common hurdles keeping the technology from widespread manufacturing adoption are probably material diversity, speed, surface quality, and dimensional accuracy. Industrial 3D printing will eventually get to a point where it's not simply replacing a current process, but has come into its own and offers something entirely new with differentiated value from existing manufacturing technologies. We're seeing early signs of this already. For example, one advantage additive manufacturing has over other methods is the ability to produce metal parts with more complex internal geometries -- SpaceX has taken advantage of this and incorporated these end-use metal parts in their rockets. Another interesting barrier is the adoption rate of 3D design skills and design thinking. Once these skills get to a point of ubiquity in education and professional training, we'll see even more amazing applications in the mainstream.